Set in a pair of stately heritage houses on a hidden-away street, FAB Hostel (formerly Baan Sathorn Backpacker) bucks the sleek and trendy hostel trend by going with a more classic Thai design. The homely vibe, relaxed atmosphere, no-frills accommodation and “authentic” neighbourhood will appeal to budget travellers seeking something beyond the ordinary. 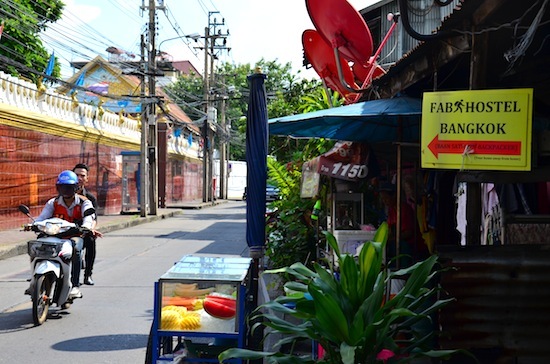 Providing a more “local-style” Bangkok experience. 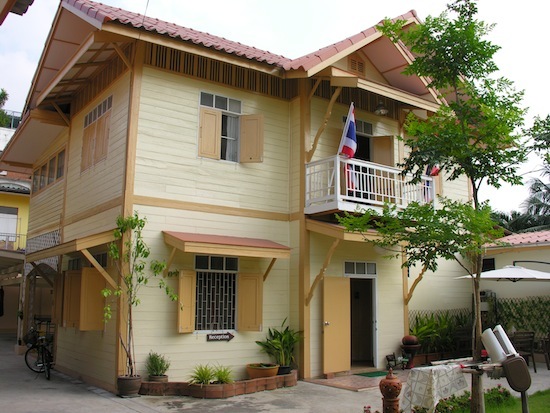 The hostel occupies two attractive wooden houses that received a fresh coat of cream-coloured paint before opening in 2013. We had the sense that these were once home to a wealthy family or monks ordained at neighbouring Wat Prok. The spacious compound is surrounded by faded cement walls and reachable from the street through a steel gate that’s locked at night (guests can buzz themselves in after hours). They could have easily made this a pricey B&B. Outdoor hangout areas dot the grounds and are shaded by trees. Behind the cosy reception area, a comfy communal lounge is equipped with sofas, floor cushions, a guitar and wide flatscreen TV. Behind the main house sits a ping pong table, next a punching bag. Guests can also play darts or gather around long wooden tables over some beers. The friendly staff also run affordable Thai cooking lessons for guests. Many of the guests are solo travellers looking to make some friends. Inside, kick off your shoes and enjoy the silky sensation of polished original teak wood on your feet while ascending the stairs. 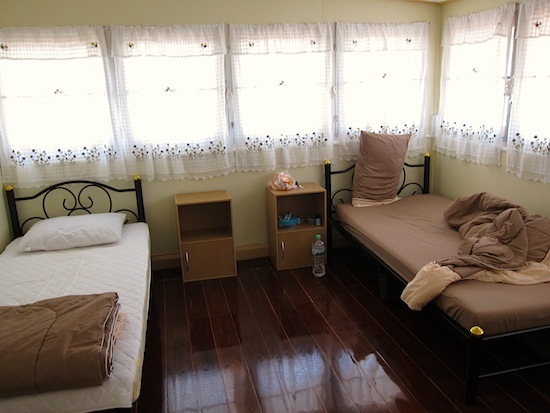 The glossy floorboards extend into guestrooms, available in single, double and mixed dorm (or “family”). Some on steel bunks and others on simple single frames, firm mattresses are covered with fresh sheets. Apart from a small desk and night stands in some rooms, the beds are the full extent of interior furnishings. The single room is fan cooled, but the others are air-conditioned. Clean hot water bathrooms are shared. Small lockers are located downstairs, and WiFi is free. Fabio (or “Fab”, one of the owners) keeps things simple by charging a 400 to 450 baht per-person rate, regardless of the room you choose. Although dorm beds lack private reading lamps, this isn’t bad value when you consider all of the common spaces. We were told that small groups of travellers often rent out whole rooms in advance. 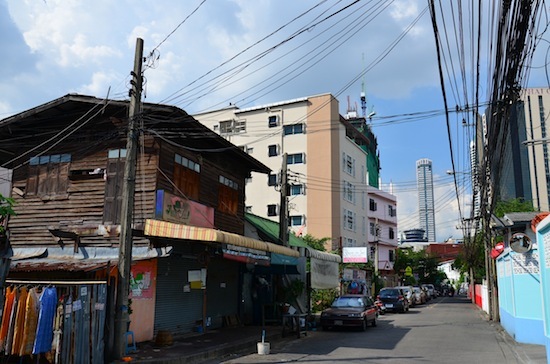 Bangkok’s central business district is little more than a stone’s throw from Baan Sathorn, but you’d never know it while strolling the narrow lanes that lead to the hostel. Picturesque old wood houses line the street, many of them fronted by potted trees, laundry hung next to Chinese bird cages and stands slinging noodles and som tam. This is a very old and eclectic part of the city; a mosque, Hindu temple, Thai Buddhist temple and Chinese cemetery are all a short walk from the guesthouse. An interesting neighbourhood to poke around in. Strolling around this area can feel like being transported to Bangkok of 50 years ago, but Surasak BTS station and several shiny high-rise hotels are only 15 minutes away on foot. The bustle and nightlife of Silom Road, the greenery and swan boats of Lumpini Park, Siam Square’s modern shopping malls and the central express boat pier on the Chao Phraya River are all no more than a 10-minute skytrain ride away. 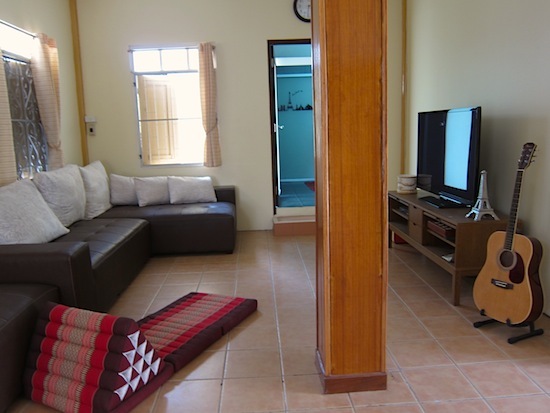 If you’re looking for something more conducive to an extended stay, on the way to FAB you’ll pass several small serviced apartment buildings that often rent out reasonable double rooms with air-con, fridge and TV for around 650 baht a night. Last updated on 23rd July, 2017.